“The response to the inquiry was an offense addressed to the Constitutional body. Same content answers to 8-9 questions is a very bad variant for a country claiming to have parliamentary system of governance. This should have its consequences. The consequence is the following: Bright Armenia based on the Constitution and NA Regulation law proposed the bill on further tenure of government member. The bill will be put immediately for voting without discussion. 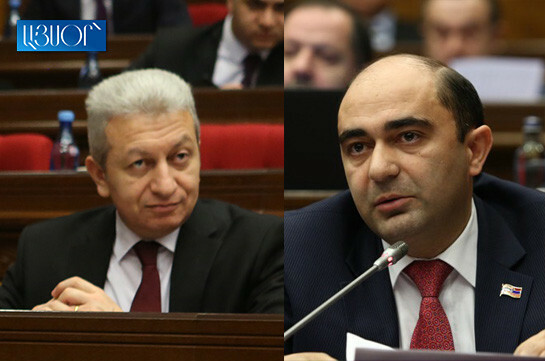 I hope the issue on further tenure of Mr Janjughazyan will be approved and hence no minister will speak with any faction in that way,” Marukyan said. Finance minister treats the issue calmly. Speaking to reporters, he said that it is part of an agenda and the lawmakers have right to voice such issue. Asked about the attitude toward expression of doubts over his ability to handle minister’s commitments, Janjughazyan said, “I regret it, I would not like it to happen, but I am also objectively calm, in the opposite case it may seem that everything is ideal. It helps not to lose soberness,” the minister said, adding that it is impossible to satisfy all.